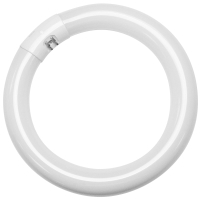 This 4-pin circular T9 lamp from TCP Lighting is energy efficient, consuming only 20 watts of energy. It has a light output of 1,200 lumens, making it a suitable replacement for a 75-watt incandescent lamp. This TCP light has a color temperature of 2,850K, emitting a warm white glow. It has an average lifetime rating of 10,000 hours. This long lifetime eliminates the need for frequent replacement. It is designed for use in table lamps, ceiling fixtures, and floor lamps.